Nothing new under the sun, but still relatively cool: a “virtual keyboard”. How does this work you ask? Well, ok, so, you can use the VKB (Virtual PC Keyboard) with both your laptop and PC and with a compatible mobile device, be it a Smartphone or a PDA. It uses both infrared and laser technology to produce an invisible circuit and project a full-size virtual QWERTY keyboard onto any surface. 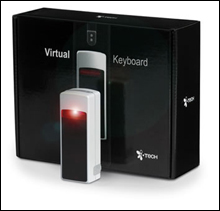 The virtual PC keyboard behaves exactly like a real one: direction technology based on optical recognition enables the user to tap the images of the keys, complete with realistic tapping sounds(! ), which feeds into the compatible PDA, Smartphone, laptop or PC. […] .2 meter X 1.2 meter, and is projected to cost around $27,500. This might go well with the virtual keyboard we talked about earlier. Story Via Asahi News. Ah yeah, this little thing… If I remember correctly it was suppose to be out last year, but the date of release was pushed back for some reason. how far can it project?